I first started building electrical and electronic circuits from about the age of 7. I started building all sorts of interesting circuits with Electronic kits using the supplied instruction manuals. I quickly graduated to taking broken electronic items apart to see how they work, this also provided me with a vast array of switches, components and meters I could use in my own projects. I was always heading in to town to buy components or those really interesting Babani books full of Electronics circuit ideas and projects. I also bought Everyday Electronics magazine and marvelled at the circuits that I could afford to build, and the ones that were too big or which were out of my price range, but it was still interesting to see how they worked. I was entirely self taught in electronics until I was 14, when I attended a set of after school ‘Build a Radio’ classes run by a teacher at Evesham High School in the 70’s. In these after school classes we built our own working radios from discrete components. Later I supplemented my knowledge by attended a TV and Radio Repair night school class. This helped me to make money by repairing televisions for neighbours, and repairing CB’s for the local CB Radio enthusiasts (of which I was one). Although I had served my apprenticeship as a motor mechanic and HGV Fitter, it now looked like my career would be in electronics…. until I bought my first computer. I had my first brush with programming at school in the 1970’s when I attended an after school course in programming an electrical/mechanical calculator/machine/device, I am not sure what the machine was but I still have a printout from the device. This printout (which is about an inch wide) was the program I wrote to calculate the distance travelled by a falling object under the influence of gravity. Following this I became a HGV fitter and spent every Monday away from my work in a garage on day release, studying for my Motor Vehicle apprenticeship in a local technical college. I discovered the college had a mainframe computer, so I would spend my dinner time in the computer room, using the terminals connected to the mainframe, there were no monitors at that time, the output was on to rolls of paper. I got my first computer when I bought a ZX81 on 7th November 1982 and played the breakout game I bought with it, I then read the manual that came with the computer and was hooked, I taught myself programming from the ZX81 manual. I did not know of anyone in the area who even owned a computer or knew what they could do, so I had nobody to discuss computers with, they were a bit of a specialist subject back then. I started working flat out learning how to write software I then graduated to the Sinclair Spectrum, and then to the Sinclair QL. In 1985 I went in to WH Smiths in Preston and saw a typing tutor for sale for £29.95. I told the shop assistant who I regularly chatted to, that the software was over priced and that I could write something better myself, he challenged me, and I set about writing Touch Typist to prove my claim. Two weeks later, after working flat out, I took a program in to show him and he was amazed that it was better than the one he was selling, he said that I should market it. I then set about writing new features and expanding the software until it was ready for sale. I managed to get an Enterprise Allowance grant of £40 per week for one year to start up self employed, writing software. I started my business from home in October 1985, later on that year I attended a computer show in London as an exhibitor selling my one product, I was please that I sold about 19 copies that day. Back in the 80’s, before Microsoft wrote Windows my company had our own multitasking/task switching front end for the Sinclair QL called Taskmaster, this gave you multiple programs running in their own windows, all the programs multitasked, this meant that they all ran at the same time, you could set your database printing out labels and still use your wordprocessor or any other programs at the same time. Also included in the package was a file handling program similar to Windows File Manager, a pop up notepad and pop up calculator which once closed with a two key combination transferred the text out of the notepad or the result from the calculator to the underlying program. This allowed, for example, the ability to be working in your accounts package and, with a simple keypress up popped up the calculator, you could perform your calculations and then by pressing two keys the calculator closed down and as it disappeared it typed the result to the input box on your accounts package, the notepad worked the same way. This software also gave you a macro recorder and player language which could operate ANY program running in your machine thus automating common tasks. A software based printer buffer which was configurable to use spare ram saved customers the cost of buying the only other alternative at the time which was hardware printer buffers which were expensive. When you switched on your QL, Taskmaster remembered what programs you were using when you closed it down and they were loaded up ready to go. In 1987 my company Sector Software released a spelling checker for the Sinclair QL by the name of Spellbound, this checked your spelling in real time as you typed, this is a feature that many thought that Microsoft invented in their recent Microsoft Office software, we were doing this ten years earlier than Microsoft. Spellbound spelling checker did not only work within a wordprocessor though, by linking itself in to the keyboard input queue it worked exactly the same in ANY program running in the computer, for example you could be in your accounts package, spreadsheet or even a game and still turn on the spell checking by simply pressing a two key combination, all your spelling from that point onwards being checked as you type, pressing two keys switched it off. I noticed an increase in the demand for tuition from people wanting to learn to write their own programs, in the 80’s this became an integral part of the services I provided. It would later lead to a lifetime of teaching computer skills. After realising that many people were experiencing difficulty programming databases, Sector Software released Flashback, this was a pop up database which could be called up at any time with two key presses, it was very simple to use and configure. When it was closed down Flashback would either simply disappear, or it would transfer the current record in to the underlying program at the programs cursor position. In 1987 I started my own Bulletin Board. For those who do not know the term, this is a system where my computers answered the phone. My bulletin board ran from 6pm (after the close of business) through to 9am the following morning. This allowed people to use their computers to log on to my computers, leave messages, talk to others and download software. This was an online meeting place for computer users with modems to dial up in a similar way to the way the Internet is used nowadays. In the mid 1980’s I attended ZX Microfairs at the Horticultural Halls, Westminster, London as an exhibitor. I then decided to hold my own shows in the North West. Seven very successful computer shows were held at Stokes Hall, Leyland, Lancashire at the rate of two or three per year. These were the first computer shows in the area. 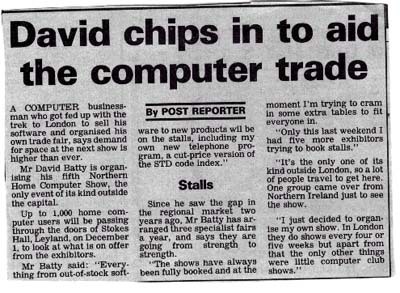 I did not continue organising computer shows due to many others getting on the bandwagon and starting competing shows in the area, these were box-shifter shows as they still are today, my shows were attended mainly by the people who wrote the software, you could chat to the authors direct as they sold you the programs. The first computer show in the North West was big news, it was featured in the Lancashire Evening Post as well as other local newspapers, Radio Lancashire brought their outside broadcast van to the show because it was something so new. They interviewed me live on the radio amongst the stalls before they went around the show with a radio microphone, talking to people asking them questions like “what it was like to attend a computer show” and “what have you bought”. Little did I know how from these first beginnings that computer shows would swamp the area. The first show I organised was attended by about 2000 visitors, which at the time was an amazing response. In 1988 I bought a Commodore Amiga and started converting my typing tutor ‘Touch Typist’ to this machine, Touch Typist was a best seller on the Sinclair QL and soon became even more so on the Amiga. I later converted Touch Typist to run on the Atari ST and the Acorn Archimedes. I became a regular exhibitor at computer shows from Scotland to Germany and Belgium. I was exhibiting at Schloss Bedburg (Castle Bedburg) in the town of Bedburg in Germany one year and saw a Sinclair C5 parked outside the castle, I could not resist the temptation to take it for a quick spin around the castle grounds, luckily I was not caught before I parked it up where I found it. I had one of the first Z88 computers in the country when I was asked by Clive Sinclairs’ company Cambridge Computers to beta test their machine. After a trip down to Cambridge to sign the non disclosure agreement and take possession of a Z88 I set about testing the machine and wrote the first QL to Z88 link kit, this was followed by an Amiga to Z88 link kit. These were file transfer and print spooling programs which allowed you to transfer your data to and from your laptop computer. The Z88 was similar to a modern tablet device, it was A4 in size, rand on its own internal batteries, had software built in such as a wordprocessor, database, spreadsheet and Z88 BASIC programming language. After obtaining a licence from British Telecom, I released STD Index on the QL, Amiga and IBM PC, this was British Telecom’s dialling code database of UK and foreign numbers on computer disk with my own search engine, this was very useful for reverse searching numbers. Demands for formalising the computer skills of my students led to my home office becoming an RSA (Royal Society of Arts) registered Test Centre in the early 1990’s. This allowed me to deliver courses run by RSA, the CLAIT (Computer Literacy and Information Technology) course was ideal as a starter course in computing and was adopted for my students. My next software release was Wordsmith on the Amiga, this was a crossword, anagram and puzzle solver for crossword and competition addicts. I found out that this software was also being used in schools to help children find rhyming words or words on a particular theme. Because of a personal need for an instant reference to the contents of technical articles I wrote Shopper Index . This was a database of Amiga Shopper magazines contents in a very fast 100% machine code stand alone search engine. This gave readers of this magazine instant access to years of Amiga Shopper magazine articles, letters, reviews and tutorials all wrapped up in my very fast search program. As well as being on sale to the general public, the editor and staff at the magazine also used my software to keep track of their own content! Tandy’s educational arm Intertan contacted me to arrange for me to write a link to their WP2 computer. This worked in a similar fashion to my Z88 link, allowing up and downloading of data contained in the WP2 for archiving on a home computer or spooling the documents to the printer. After being sent a digital camera by Fuji in 1997 and one from Sanyo in the same year I set about writing software to link these to a computer. By this time I had become known as a person to go to for communication links between various pieces of technology. I wrote software to calculate prisoner sentences and release dates according to HM Prison Service rules. This software calculated a prisoner’s release dates for either consecutive, concurrent or mixed consecutive and concurrent sentences. This took into account time spent in custody (police or otherwise), ADA’s(additional days awarded) ADAp’s and a host of other variables. Data entry was simple and fast, the calculations were even faster, taking no more than a few seconds to calculate a complicated record, something that would sometimes take hours when done manually. This program was originally written on the Commodore Amiga and was converted to run on IBM compatible machines after major problems in the Prison Service with doing the calculations manually ( You may remember the time when 500 prisoners were let out early when they found out that they had been calculating their release dates wrongly). The software knew all the rules and the amendments to the rules issued over the years. Output was to the standard sentence calculation white/pink/or blue forms complete with a sentence chart. The Home Office had originally said it was too complicated to computerise, which is how I ended up writing the software (I like a challenge). I rewrote my best selling software Touch Typist for the IBM compatible market. The software was converted from the Amiga version of the program by the same name. Touch Typist is a typing tutor which sold over 100,000 copies on the Commodore Amiga, Sinclair QL, Atari St and Acorn Archimedes. One magazine reviewer said that “compared to Mavis Beacon and Intellitype (it’s closest rivals) Touch Typist is a lot more straightforward and rewarding to use”, need I say more. Touch Typist was released on CD ROM for Microsoft Windows and a short while later was released as a software download. This was released as an automated online payment/download system at a time when paying for and automatically downloading software online was not a common thing to do. Since the 1980’s I have written various custom software packages for local businesses to handle customer details, invoicing and data conversion. I am usually called upon when a business has large amounts of data that needs conversion from one format to another. I design and write custom software to handle the job automatically. I do some website design work but that is not one my main activities, it was in the late 90’s and early 2000’s, but then the market became saturated with designers, so instead I specialise in gaining visitors to existing websites by a multitude of techniques from simple Search Engine Optimisation through to operating my own specialist software to market websites. My office staff now handle all the website, server, seo and online work for our customers, allowing me to get on with other projects. I have been operating in the virtual world of Second Life since January 2007. I use Second Life to organise meetings and training sessions, I build, write software and generally learn all there is to know about Second Life. This platform is excellent for some businesses and I have made many new friends, customers and business contacts through this medium. I was the first person in the UK offering Second Life courses back in 2007. I have done a lot of filming, editing and producing online training content for myself and for other people over the years. Although I first had video on my website in 2001, I only started producing podcasts (for Itunes etc) in January 2010. From an early date I used to deliver talks to local companies telling them that videos, podcasts or Internet TV was the future medium for businesses wanting to make an impact on the web. Today my content is consumed in online courses via my own and other websites. With the growth of mobile phones came the growth of software developed for phones. In 2010 I started writing software for mobile phones, this was mostly internal use software but I currently have a few projects on the go for the Android operating system and now make a living from adverts in mobile phone applications and games. Because I found it difficult to be in many places at once, I decided to move some of my courses online. This allows me to train a greater number of people, and not be restricted to where I can train based on geography. The first of these courses to be released was my Online Photoshop Course to replicate the content from my Photoshop classroom training. This led to the development of various online courses in programming, computing, games design and GCSE courses for teacher training. I have developed courses for teachers to learn about the Raspberry Pi, Scratch, Visual Basic, and Python programming languages. I am also very busy delivering courses on GameMaker Studio. Nowadays I get a lot of my work from www.codecollege.co.uk website, and I work freelance for other training organisations who require my skills. You may meet me on a programming course, when I am exhibiting at an education show such as the BETT Show, or maybe as an attendee of Techcamp, where I am a lead instructor. I have always been interested in flying (I used to work in the flying school at Blackpool Airport at weekends). So I decided to become CAA licenced to do commercial video and photography with my DJI Inspire. This craft weights 3kg and can travel at 50 Miles Per Hour. it is an idea craft for producing aerial shots for websites, film companies, businesses, for creating 360 degree panoramas, site mapping for archaeologists and much more. Working with the UAV (Unmanned Aerial Vehicle) makes life more interesting as well as providing a good income from film and related work and aerial photography for customers websites. I have released three skills(applications) for the Amazon Echo, Amazon Fire TV and other Alexa enabled Devices and have several more in development. Writing for voice interfaces is interesting and the devices that support it have given me some great ideas for future applications. I have written two skills to help GCSE Computer Science students learn and revise at home and have written one for accordionists. This is an interesting market, and I am developing my skills in it when I have time. A part of my work that I really enjoy, is delivering face to face and online courses in Gamemaker Studio (from YoYo Games). I have used Gamemaker for many years and I really like its ease of access for beginners and its power for advanced users. I was a beta tester for the new Gamemaker Studio 2 from early 2016 onwards and deliver regular training sessions in the use of Gamemaker Studio for rapid game development. This has been a short overview of what I have done and what I get up to, I will update this in my spare time, if I have any !!! and on computers, then afterwards I enjoy my hobby… which is working on computers!